Golf games, much like the real-life sport, tend to elicit two very different emotions. For some of us, they're the ultimate cross between relaxation and competition, but for others, they're an exercise in abject frustration that often lead to hacked up fairways and bent clubs. Of course, we'd all prefer to be improving our handicap in the former, and Nintendo Switch's latest trip up the links aims to find that chill sweet spot. 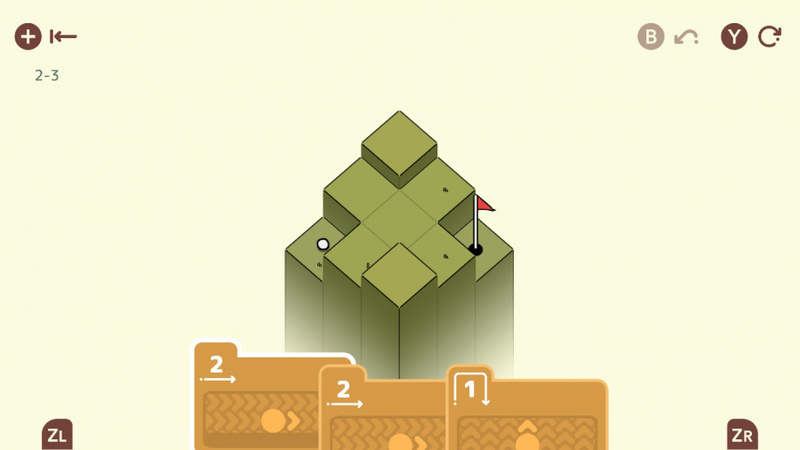 Enter the isometric puzzle pitch that is Golf Peaks. Originally released on iOS at the end of 2018, Golf Peaks is one of those little games that's so simple that a) you're surprised no one thought of it sooner, and b) you know that 'simplicity' is just a foundation for some devilishly challenging trick shots later on. Each course exists as an isometric set of platforms, and your task is to get your ball into the hole in the fewest number of strokes. So far, so golf. 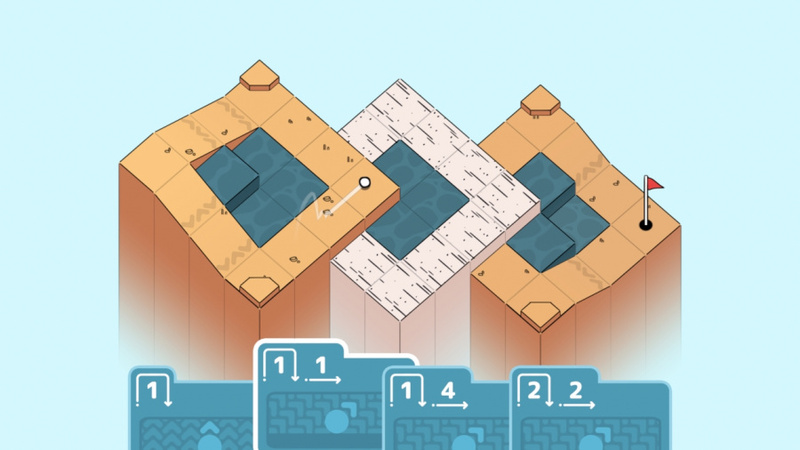 However, rather than simply hitting the ball until you've presumably caved in half of the course, you're instead given a set of cards that each represent a specific number of spaces you can move at a time. 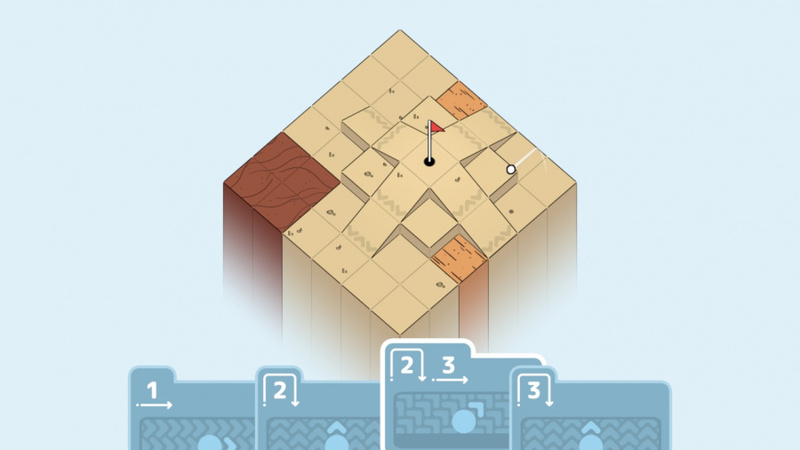 Being a puzzle game first and foremost, the end result is something that more closely emulates the likes of Monument Valley and Bad North, albeit crossed with the tactical movement planning of Hitman GO. 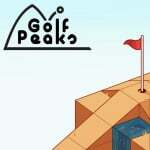 The courses start off simple enough, with only a simple mix of corners to traverse, but, as expected, the difficulty slowly starts to creep up as you start getting the handle of Golf Peaks' very accessible premise. The game even tells you how many moves are needed to complete it. There's one optimum solution, and while it might not be obvious at first swing, you've got all the information you need to sink that ball like a pro. 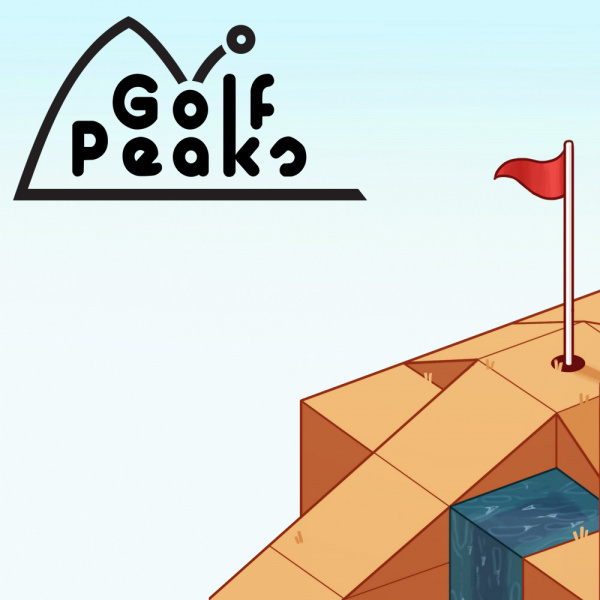 Eventually, Golf Peaks starts adding in various hazards such as water and sand traps, and more unusual obstacles such as portals. Each one comes with its very own mini tutorial so you can really get the hang of the dimensions they bring to the game before challenging each one properly. These hazards affect the ball in different ways, adding a little more complication to proceedings. When certain courses start juggling multiple obstacles and traps, things start to get very tasty, but it's all channelled through that same relaxed prism so however tricky each challenge becomes, you always know there's a simple solution to get there. When coupled with all manner of special shots and strokes – with each one sending the ball a specific distance – even the seemingly simplest of courses can be a real head-scratcher. Even something as simple as a set or corners will push you to think in three dimensions. Can I hit the back off that cushion to reach that corner? Which order or shots do I need to take to get around these multiple sand traps? It’s a the perfect kind of short burst gameplay loop that suited mobile perfectly, and it’s just as snug on Switch. You can play via the touchscreen, or you can make the most of those analog sticks and face buttons. Using the left stick to aim the ball and ‘A’ to select your shot choice offered a little more tactical feedback than a touchscreen input, but you can seamlessly switch between the two at will if you so wish. It’s just a shame that Golf Peaks is over so quickly. There are plenty of worlds, and their respective courses, to burn through (and bonus ones thrown on top), but we swung our way through all of them in a few hours. Still, for such a low price, it’s difficult to grumble too much. Neato, I'll keep an eye out for this one in eventual eShop sales. Meh. I can live without this. Besides I need to restart and complete the highly enjoyable Golf Story. And where the heckers is that snooker game? Short games are the very good friends of my already too long backlog ! Watch the game credits until the end for a surprise. Bought it yesterday, played for a bit and realized I was already 25% in. Going to play in shorts bursts now. I enjoy it for € 4,99. For a fiver, you can't go far wrong. I'll grab this over the weekend. I was surprised to see that this was bargain priced at about $5 here in the States. ...Planning to show it to my wife and see if she digs it too. ...Looks to be easy to get into. Looks like Qbert mixed with golf. Much cheaper on iOS and seems like it's better suited for mobile than Switch. Pass. Can we just get Mario Golf on a console again! It's been since the Gamecube since a Mario Golf title released on a nintendo console!!!! Come on!!!! At least Everybody's Golf and the Hot Shots Golf franchises are still playable for me! You can tell how this is obviously a mobile game that was designed around phones, all that unused space on the sides is a giveaway. Seems interesting but I would rather just play this on my phone. @GrailUK Just going out on a limb here, but I'm guessing a game this small and this cheap wouldn't get a physical release, or that it would be super unlikely. Have you heard it might? @Keldorek No, sorry. I am old school and like to hold things in my hands. I like it. After 20 minutes though, I checked to see my progress and saw that I was 27/108 complete. I quickly put on the brakes and played some Splatoon instead. Gonna have to play in short bursts of 10 stages a session. Some more courses would be nice. I’ll take some dlc for this one. @GrailUK That’s what she said. They should’ve put this and it’s sequal (I assume it has a sequel) as a bundle. It’s always odd seeing really short games like this in a sea of more substantial indie titles.